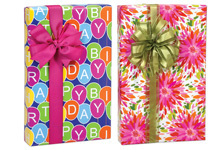 Tissue gift paper in bulk with lovely floral designs and natural prints. 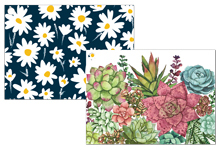 Handpainted watercolor flowers in bright red, pink and yellow on a white background. 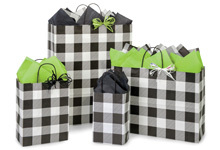 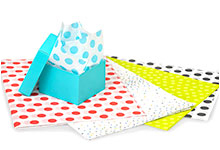 Polka dot printed tissue paper for gift bags in a variety of colors and sizes! 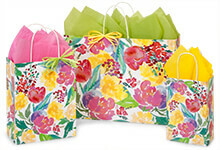 Gift basket boxes with colorful floral and classic designs. 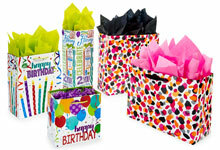 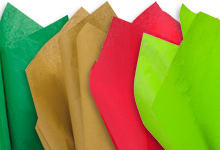 Bright and colorful gift tissue paper in fun and traditional shades! 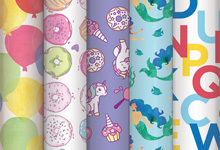 Premium printed cello rolls featuring colorful everyday designs. 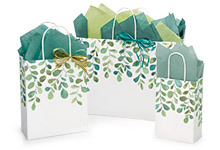 Paper gift bags with handles feature hand painted vines in soft hues of blue and green. 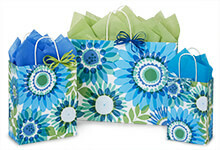 Beautiful Blue and Green flowers on a white background. 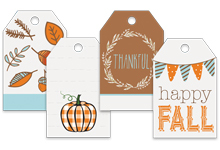 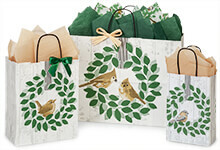 Farmhouse Birds shopping bags have green leaf wreath, black pinstipe ribbon accents and naural birds. 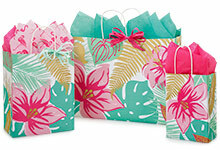 Sweet pink floral with mint green background. 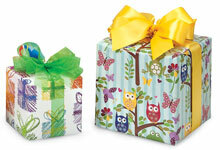 Four Piece Sets of Solid Nested Boxes with a round or square design. 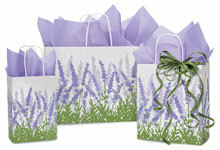 Recycled Lavender Field bags feature a beautiful botanical silhouette. 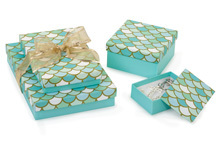 Aqua Blue Jewelry Gift Boxes with white cotton fill. 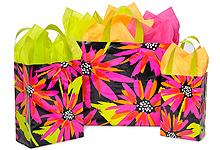 Vibrant pink and orange flowers with bright green leaves on white kraft paper shopping bags. 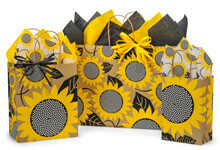 Recycled brown kraft paper shopping bags with bright yellow sunflowers. 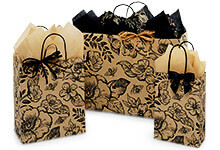 Elegant paper shopping bags with a black brocade design on white glossy paper. 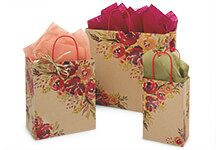 Glossy Paper Bags with pink blooms and gold accents. 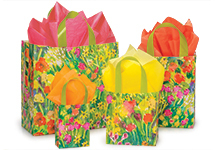 Wildflower Meadow Shopping Bags feature fields of flowers in pink, blue and yellow. 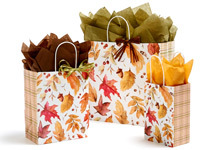 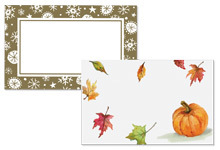 Beautiful flowers and petals with falling gold metallic leaves on frosted clear plastic bags. 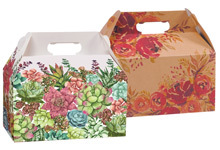 Unique Chalkboard Flowers paper shopping bags have bright hand drawn flowers. 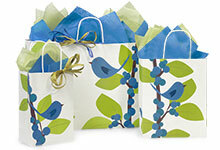 Recycled White Kraft Shopping Bags feature bright blue bird are great for Spring and Summer. 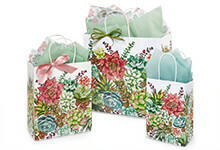 Watercolor Garden plastic bags feature handpainted art in a beautiful garden design. 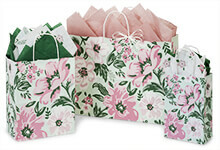 White Kraft paper bags feature pink floral rose design, full of vintage English cottage charm! 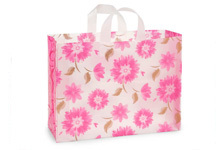 Striking pink flowers on white kraft paper shopping bags. 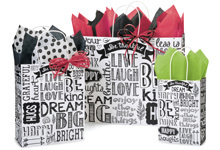 Paper Shopping Bags with handles have chalkboard style text with inspiring messages. 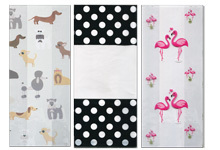 Now On Sale! 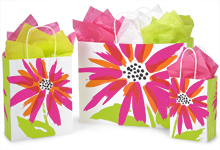 Recycled Paper Shopping Bags with bright green daisies. 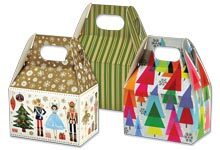 Now on Sale! 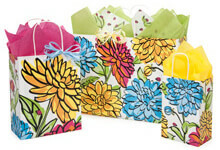 White Paper Shopping Bags with pretty blue and brown flowers. 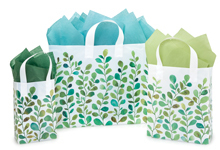 Watercolor Greenery reusable plastic gift bags feature original handpainted vine design. 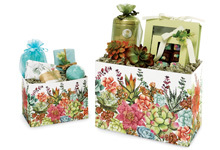 Mermaid Paradise boxes have aqua and green scale design with gold accents. 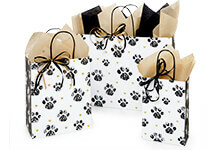 Plastic Gift Bags with a bold floral print on a black background. 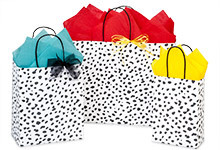 Paper shopping bags with handles! 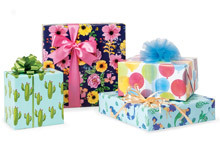 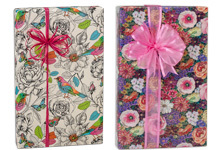 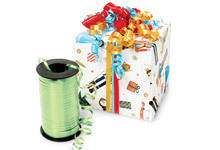 Brightly colored floral gift wrapping paper! 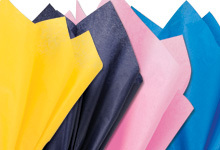 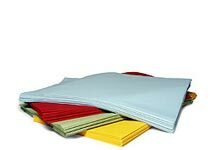 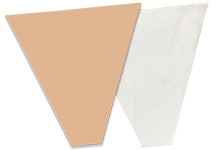 Printed and solid color tissue paper! 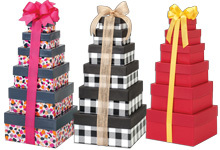 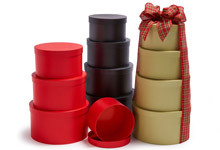 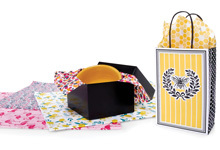 Gift Boxes and Favor boxes for parties! 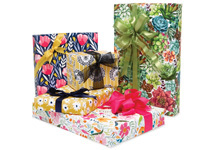 Jewelry gift boxes in bright colors and fun prints! 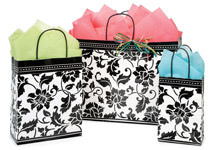 Cello treat bags and cello basket wraps! 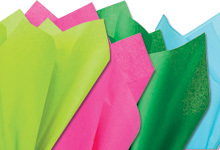 Spring is one of the best times of the year to begin marketing campaigns. 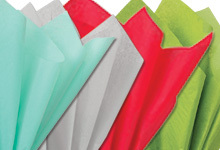 People are outside enjoying the warmer weather, walking from shop to shop! 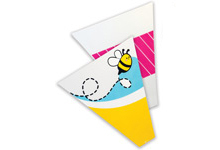 What better way to get your name in people's minds than to make your customers a walking billboard for your business! 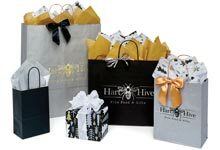 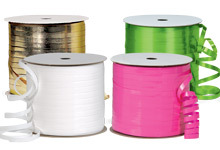 Let one of our experienced custom print agents help you customize your own store packaging or visit our custom print page for more information. 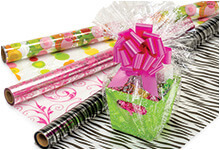 If you do not see what you like, let us help you create something just for you! 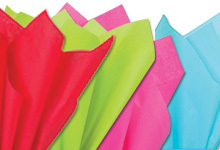 If you can dream it, we can make it!